Bed bugs are insects that feed on the blood of humans and animals. The Cimex lectularius is classified as a distinctive bed bug species because of its preference to feed solely on human blood. 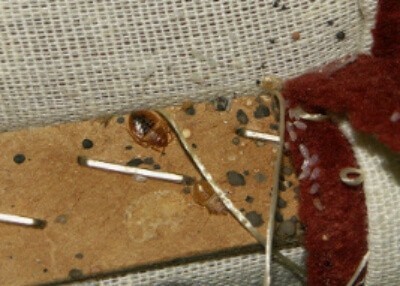 Cimex pipistrelli, on the other hand, feeds on animals instead, as do two other bed bug species – Cimex adjunctus and Cimex pilosellus. Bed bugs are most active at night and hide in out-of-sight locations during the day. An adult bed bug is brown-coloured and has an oval body shape. Its body features a pair of wings located on the front, however the insect is unable to fly. The entire bed bug body is also covered in tiny hairs which can’t be seen with the naked eye. The maximum size an adult bed bug can reach is about 5 mm in length and 3 mm in width. The smallest are only about 2.5mm long – almost the size of a bed bug egg. However, during an infestation bed bugs of various sizes may be observed. This depends on the scale of the infestation. If the bed bugs' population has reached a critical amount, they can form small clusters that can be easily observed. They are also easier to spot immediately after feeding since their bodies are virtually fully transparent. In case there are only a few insects crawling about in your home that are hidden within tiny crevices and cracks, spotting them may be next to impossible. Bed bugs usually live in groups and rarely part with the rest of the colony. However, you can find plenty of signs that point to their presence if you know where to look. But before doing that, note that it’s possible to find bed bugs in other premises besides your bedroom for example in living rooms, bathrooms, or inside laundry rooms. 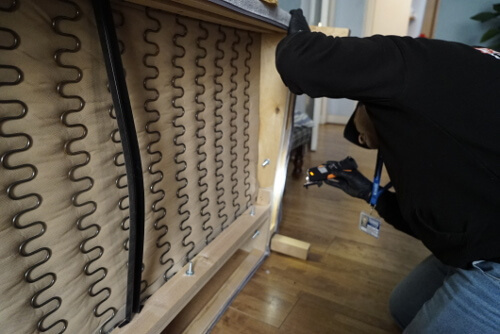 A bed bug may also be easily transferred from one place to another via an infested object – suitcases, clothing, and even electrical appliances will usually do the trick. When bugs excrete after feeding, they leave some of the ingested blood behind. Usually, you can spot these marks on items, such as: pillowcases, mattresses, sheets, other bedroom object or surfaces. Bed bugs go through multiple life cycles and shed their skin after each stage. When the bed bugs hatch, they can leave tiny eggshells across the infested area. Such marks are usually found on the bedding and are left by the insects a short time after they stop feeding. Basically, these spots are the result of the host’s blood being excreted by the insect once it’s fully processed. While other insects, such as flies and spiders, can leave similar spots, their location differs significantly. 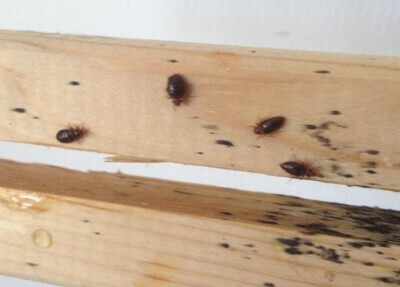 As long as the blood marks are found on the sheets, on the mattress and under the bed, you can be certain that you’re dealing with a bed bugs infestation. Of all bed bug signs, seeing the actual living things in front of you is obviously the most telltale sign that you have a bed bug problem. However, you should know that there are some insects that look very similar to bed bugs so, if you’re having doubts, always seek the help of an experienced entomologist to identify the infiltrator with 100% accuracy. Don’t ignore an infestation even if you’ve spotted just a few insects – this doesn’t mean you’ve encountered their entire population! Their actual number is probably much higher due to the fact that they prefer to remain in hiding during the day. We recommend taking immediate action as soon as you spot any of the insects roaming about. Red spots on the legs, neck, back, arms, and on the face. 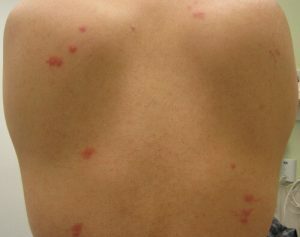 A bed bug bite often resembles a bite mark left by other animals, such as fleas or mosquitoes. This means that finding bites similar to what’s described above doesn’t necessarily mean that you have bed bugs in your home. It might be another pest that triggers this skin reaction, dust mites included. Tiny in size, bed bugs are able to infest a variety of narrow cracks and crevices around the house, and can sometimes be even found living within electrical appliances. The usual hiding spots are: suitcases, clothes, shoes, movable objects, mattresses, bedding, electrical bedroom appliances. They can also squeeze inside switch plates, vehicles, and any other place which provides shelter from direct sunlight and humidity. Bed bugs usually like to remain as close to the food source as possible. This means that the best area to look for them is your bed, followed by the area underneath your mattress and its immediate surroundings. During severe bed bug infestations, the insects can be observed in all parts of the property as the colony quickly grows in size. Mirrors and any other wall-mounted items. 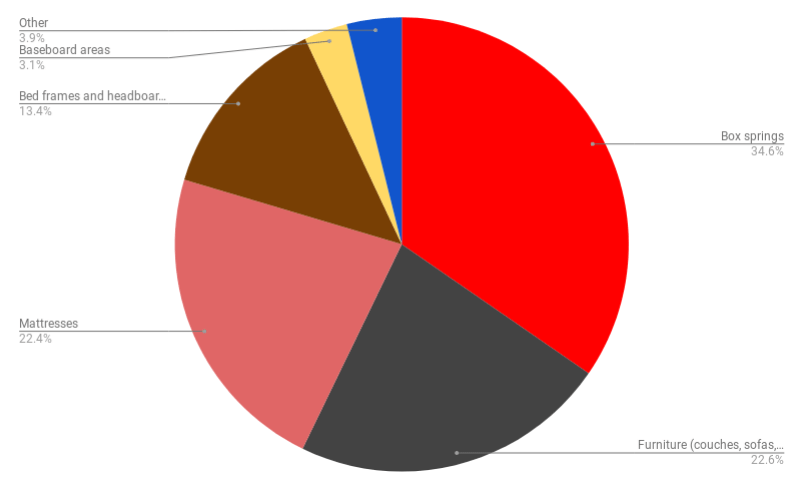 Which places are preferred by bed bugs the most? A study by the University of Kentucky on the bed bugs’ behaviour gives us an insight on what are the most usual places that bed bugs use as hideouts. The results from the study are based on the documented findings of 13 professional property inspections. 0.2% - nightstands and dressers. As you can see, the box spring is the first place you need to investigate, while nightstands, walls, and ceilings are much less likely to be infested. This is because the latter surfaces are located further away from the food source – you. Bed bugs always seek narrow places where they feel safe from harm, which makes their identification and extermination that much trickier. During the day, it’s not uncommon to spot the insects near bed frames. At night time, however, bed bugs may extend their reach to furniture inside the bedroom or can even relocate to the corners of the room. 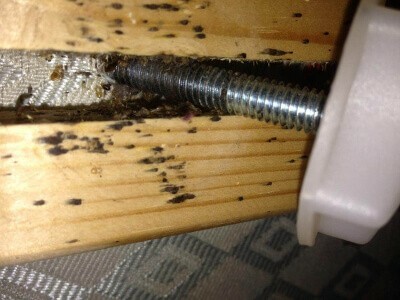 Bed bugs may also be seen near baseboards during severe infestations. When this happens, they may also resort to feeding during the day, provided they can find a host. Finding the bed bugs during an infestation is an essential step of the removal process. The sooner the bed bugs have been identified, the better for everyone who lives under the infested property’s roof. Below, we have explained all essential steps you need to take to do it properly. Use a flashlight and a flat item, for example a credit card, to check around narrow places and hard-to-reach objects. Look for any of the bed bug signs we discussed above. Wear some protective clothing, such as gloves, to avoid direct contact with blood and traces of bed bug excrements. Inspect the whole mattress, including the folds, tufts, and seams. Check objects which are less prone to infestation as well, such as nightstands and dressers. Don’t forget to inspect curtains and areas near the window, as well as door frames and places close to the ceiling. The room’s corners should also be paid attention to. Which Insects Look Like Bed Bugs? Bed bugs have lots of features similar to those of other insects. A good example is the spider beetle. This bug has the size and shape of a flea, but is oval and dark brown - just like an adult bed bug. Often, spider beetles may assume a reddish appearance, which also increases the chances of them being mistaken for bed bugs. We highly recommend the below list of Do’s and Don’ts in case you spot any signs of bed bug activity.It’s what any experienced pest technician would also recommend. If you see a living bed bug, try to trap it inside a plastic bag or another container. You can then take a photo of it and ask a professional if it’s really а bed bug or another similar-looking insect. Gather your clothes and bedding and launder them in order to destroy any bed bugs that may be on them. Use a high-temperature setting of at least 60°C, if possible. For textiles that are sensitive to heat, we recommend placing the items inside plastic bags and sealing them until you decide what to do next. A good option is to freeze those items for a couple of days at −16°C or lower. Try trapping the bed bugs by putting an encasement on the mattress and the box spring. This will prevent the insects from infesting other areas of your property. This, of course, will not kill the bugs, but this measure will buy you some time until you decide how to proceed next. Seek for professional help from local pest control experts. This is your best chance to deal with an infestation quickly. Professionals know how to check the entire premises and can treat the bugs with the latest and safest insecticides on the market. In some cases, the only effective method to eradicate the bed bugs completely is via a heat treatment, done with a diesel-fueled machine. It will heat up the premises to 56°C, exterminating both adult insects and their eggs. - Increasing the bed bugs’ resistance to some of the commonly used chemicals. Don’t toss infested furniture and other belongings away. 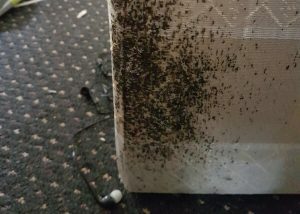 This will not get rid of the bed bugs and you can potentially infest neighbouring homes as well. Most items can be treated with a spray insecticide, so we strongly suggest consulting a professional about the type of items that can be treated against the bugs. Items under the bed are most likely to be infested with bed bugs, so avoid relocating them to other rooms as this will spread the infestation further. Leave those objects where they are − they will be treated during the bed bugs extermination process anyways. Don’t try any DIY techniques for bed bugs extermination if you have no experience and knowledge in insect control. There is lots of misleading information on the Internet. One example is wrapping items inside plastic containers and leaving them on direct sunlight which will not affect the bugs in any way. Try not to spray, burn, or dispose of anything within your home. A neat way to quickly trap bed bugs located in tight areas inside a plastic container. The vacuum cleaner is especially effective at capturing clusters of bed bugs in case you have a serious infestation. Once you remove the plastic container, carefully place it inside a plastic rubbish bag. Seal the bag prior to its disposal to prevent the bugs from infesting another home. Do it only at a high-temperature setting and with fabrics washable at temperatures above 60°C. Any linens and other soft fabrics should be safely isolated and freezed inside vacuum storage bags. That’s right − bed bugs die at low temperatures as well. All that is required is a working freezer inside of which you can put a variety of infested items. Keep them in there for about 4 days at approximately -17°C, then unfreeze the items. There is a wide range of bed bugs insecticides, all of which are used in specific circumstances. People who are not licensed to use professional grade products can only purchase their consumer grade variety. However, be warned that such products aren’t that effective at dealing with bed bug infestations. Save time and money instead by trusting an experienced and professional pest controller who has the licence to work with top-tier insecticides. If you’re interested in receiving help from certified pest control experts, you can visit our bed bugs control page for more information about the professional treatments we do.